Stop navigating from one online review site to another. We invite you to easily manage your online reviews on over 100 popular online rating and review websites. Customer reviews are the single most effective bit of marketing you can do for your company to gain trust. Your customers have to spread the good word about your business for you. Using our opt-in form or import a CSV file, you can quickly and easily launch your e-mail sequence. E-mails in your sequence will automatically be sent based on your preferred delayed schedule. Sit back and watch your positive (and negative) reviews flow in. From a central location and keep track of issue statuses. No more logging into multiple platforms. Dynamically display reviews from all platforms in a carousel or list format. No more copying and pasting. Everyone on your team who needs notifying when new reviews are published either publicly or internally. Why is Online Review Management Important? Proactive online review management is important for every business or healthcare facility because customers and patients are exposed to your ratings and reviews long before they land on your website, let alone in your office. Given the impact online ratings and reviews have on the decision-making process, businesses that want to ensure a steady flow of new patients must ensure that offline realities are reflected online. With proper management, your online reviews can become a powerful driver of new customers. Do I Have to Respond to Every Online Review? Yes! 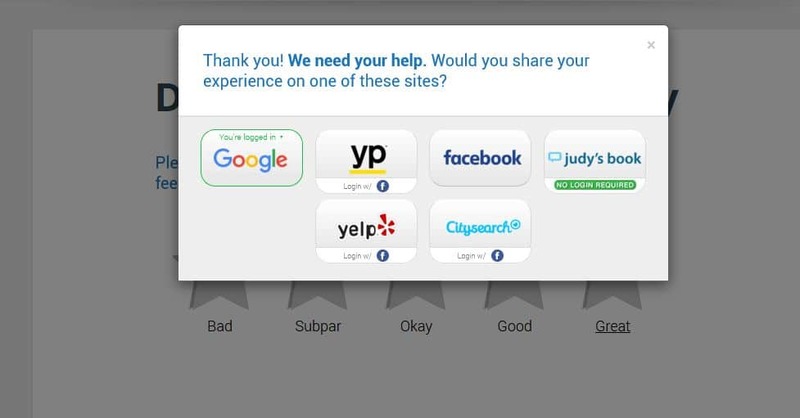 Responding to submitted online ratings and reviews shows that you care about your their experience and feedback. After all, what does it say about your business if you don’t respond? specially when the inevitable negative review is posted. Remember, responding to your online reviews is part of a successful online reputation management strategy. Why Should I Be Monitoring My Reviews? Do you like having people talk behind your back spreading false rumors? Or would you prefer to know that someone is just saying good things about your business? We’re going to guess that you’d choose the latter! Monitoring your online reviews allows you to know exactly what people are saying about your business while giving you the opportunity to voice your appreciation. If you allow your reviews to go unchecked and unmonitored, it’s possible that your business could be hit with a slew of bad reviews about an easily fixable problem or concern in your customer experience or targeted by a fake review campaign. Make sure you’re routing real customers to leave a review about their great experience while effectively managing the comments that aren’t so great. What’s the Good Word About MyReviewEngine? “MyReviewEngine is a great tool for automating the review generation process and making it as easy as possible to add this source of content to the mix.” -Brandon M.
“MyReviewEngine is nicely put together. It’s quick and simple to set up your page, and it makes it simple for customers to post reviews.” -Hayley S.